Two outfit posts in one week? I really do spoil you guys. I’m pretty sure I came close to my death shooting these – it was last Sunday which was sweltering hot. Jamie and I went to town on the shooting as soon as we found this location and I treated him to a iced smoothie from Costa afterwards as a payment for these fab shots. Whenever I’m out for a day, anything that involves anything more than a pop to the shop, or out for just a coffee, I need a backpack. I have far too many essentials to squeeze into a little crossbody bag and handbags quite frankly, 9 times out of 10, get on my nerves. Get me a backpack and I’m good to go. 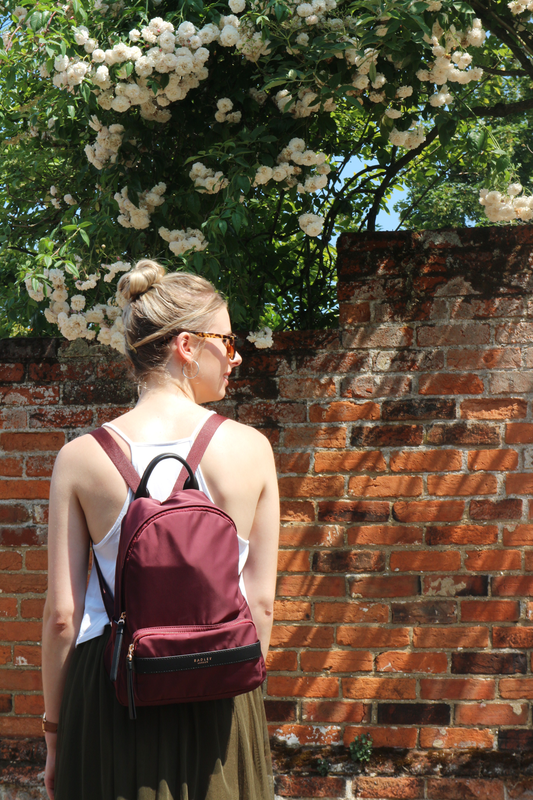 Radley have a great selection of Backpacks perfect for the day to day adventure. The Harley Backpack is the perfect size, not too big but equally not too small – just the right size to fit in all my daily essentials! Are you a backpack or handbag gal? Onto the rest of this look – I like to call this skirt my fairy skirt. It’s so damn pretty! I feel so feminine in it and although it’s a bit different to my usual style, I’m so glad I picked it up. As I mentioned earlier, this day was almost too hot to handle so I chucked on the lightest cami I had and my sandals. I can’t wait to wear this again on holiday for an evening outfit. I might be a bit quiet over the next week or so, as I’m off to Southern Spain for a Field trip for my Uni course. If you don’t know already I’m a Geography student so I’m heading off to the sun to do lots of geography-related bits for the next 10 days! If you want to keep up I’ll hopefully find some time to be posting on my twitter and instagram so be sure to give me a follow! I’ve scheduled my usual Tuesday and Friday blog posts for while I’m away so give them lots of love for me to catch up on when I get back home! "Slogan Tee and Pink Denim"